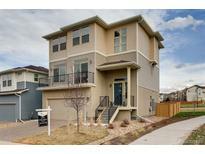 Below you can view all the homes for sale in the Aspen Meadows subdivision located in Castle Rock Colorado. Listings in Aspen Meadows are updated daily from data we receive from the Denver multiple listing service. To learn more about any of these homes or to receive custom notifications when a new property is listed for sale in Aspen Meadows, give us a call at 720-729-2316. It's one of the hundreds of things that make this more than just a house. It's a home! MLS#7708718. RE/MAX Alliance. Come take a look at this gem today. MLS#9265526. Keller Williams Action Realty LLC. ***Mountain views from Balcony AND Living Room***SUPER LOW MAINTENANCE - Snow Removal Included in HOA** MLS#5508116. Keller Williams Real Estate LLC. Built in 2015, this Castle Rock one-story offers a fireplace, stainless steel appliances, kitchen granite countertops, kitchen island with a breakfast bar, and a three-car garage. MLS#8324795. Opendoor Brokerage LLC. In Back a Partially Covered Extended Patio Overlooks a Peaceful Greenbelt~Also Note the 8 ft Levered Doors on the Main Fl~Twist Basket Spindle Stair Rail~Plantation Shutters, 5.1 Home Theatre Pre Wire Package & More...See it Soon! MLS#5058219. MB WILLMARTH REAL ESTATE SERV. Walking distance to Aspen Academy and in the desirable Meadows community, this home is truly a find! MLS#9102803. COLDWELL BANKER RESIDENTIAL 24. But you are only minutes away from historic downtown Castle Rock. MLS#9759737. PREFERRED PROFESSIONALS RE INC. This home is located in the highly desired neighborhood of The Meadows, where you can enjoy access to The Grange Pool and Taft House as well as Paintbrush and Butterfield Park! MLS#8985741. Keller Williams Action Realty LLC. A Large Wrap Around Deck Faces West For Those Mountain Views * Master Bedroom + 5 Piece Master Bath - Jet Tub + Walk-In Closet * Laundry Room Conveniently Located On The Main Level * An Enormous Walk Out Basement With A Roughed In Bathroom Included * Adjacent To Butterfield Park & Within Miles Of Nearby Trails! MLS#4851661. PERRY & CO.
Come Tour with us Today! *Please call for current incentives. MLS#5967581. Richmond Realty Inc.
Gourmet kitchen, quartz counters, stainless steel appliances, beautiful hardwood flooring all over including closets on main level, pre-wired home theater in the great room, and beautiful backyard landscaping with retaining wall on the side. MLS#9942573. Atlas Real Estate Group. Come see why we are the builder of choice for Colorado families! Call today! MLS#3668652. Valor Real Estate, LLC. Completed in 2018, many upgrades included, quartz slab counters, upgraded kitchen cabinets and appliances, window coverings, custom finished study in basement. MLS#7648001. PERRY & CO.
Stop by the sales office for more information! MLS#9117554. Richmond Realty Inc. Enjoy all this fantastic community has to offer - walkable shops, dining, parks, trails, pool and recreation! Delivery estimated for summer 2019. MLS#7289723. Richmond Realty Inc.
(Images are of similar model home. Home does not come furnished.) MLS#7106854. Richmond Realty Inc.
(Images are of similar model home. Home does not come furnished.) MLS#9944581. Richmond Realty Inc.
(Images are of similar model home. Home does not come furnished.) MLS#5962434. Richmond Realty Inc.